Natural materials processed with unrivaled craftsmanship – that has been key to the success of bed manufacturer HÄSTENS since 1852. 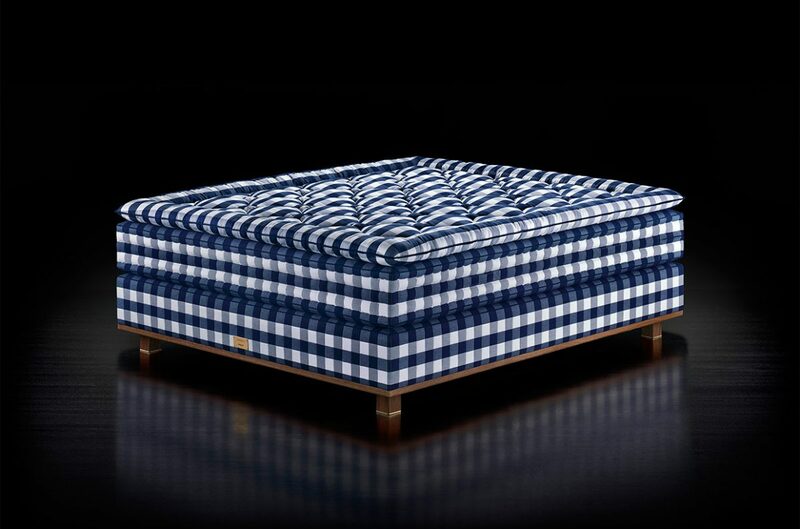 Show-business greats and sports stars appreciate the extraordinary comfort of the multilayered box spring beds with the trademark blue-and-white checked upholstery just as much as the Swedish royal court. Bright sunshine and not a cloud in the sky. In Köping, roughly 150 kilometers northwest of Stockholm, Sweden is showing off its most picturesque side. The five arches of the barrel-shaped roof provide a stark contrast against the soft blue of the sky. Above it, the brand name that is known all over the world is emblazoned in a vibrant shade of red – Hästens. As you arrive at the company’s headquarters, your first impression is akin to a déjà-vu. Pastel colors conjure up memories of decades past, and bear witness to durability and tradition. The stepped-back ground floor is tiled, and an external staircase leads to the upper floor that boasts a large glass frontage and red brickwork. Jan Ryde appears, walking briskly. He is dressed in a black T-shirt and jeans. Here at home, the fifth-generation owner likes to dispense with stuffy business etiquette. “See you at lunch,” he says and is gone again. Around the corner, two steel-pipe and green leather chairs have been welcoming business partners and visitors for many years. But just a few meters farther is where the patina and reminiscences come to an end. This is where the present begins. Past the wall of photographs of current employees lies the way out of the original building conceived by ­Anglo-Swedish architect Ralph Erskine in 1948. 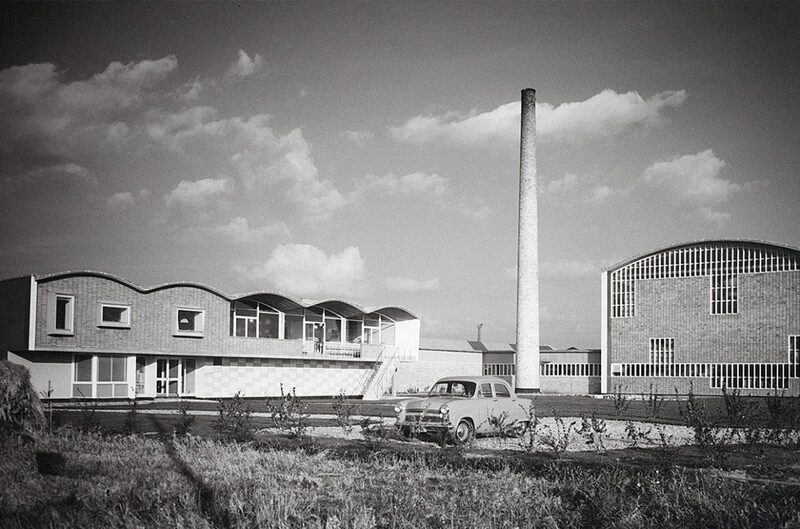 It leads directly into the modern production hall, also designed by Erskine, but 50 years later. Daylight floods the roughly 8,000-square-meter space. It looks inviting, and is energy efficient. The atmosphere is almost cozy, the employees say hello and smile. They are all added to the photo gallery on their first day at work, and so visibly form part of the company. 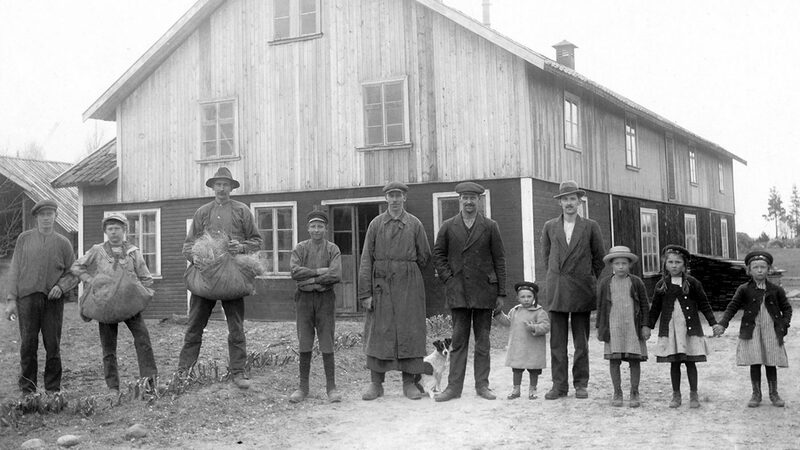 Hästens is a family business out of conviction, and has been as far back as 1852. 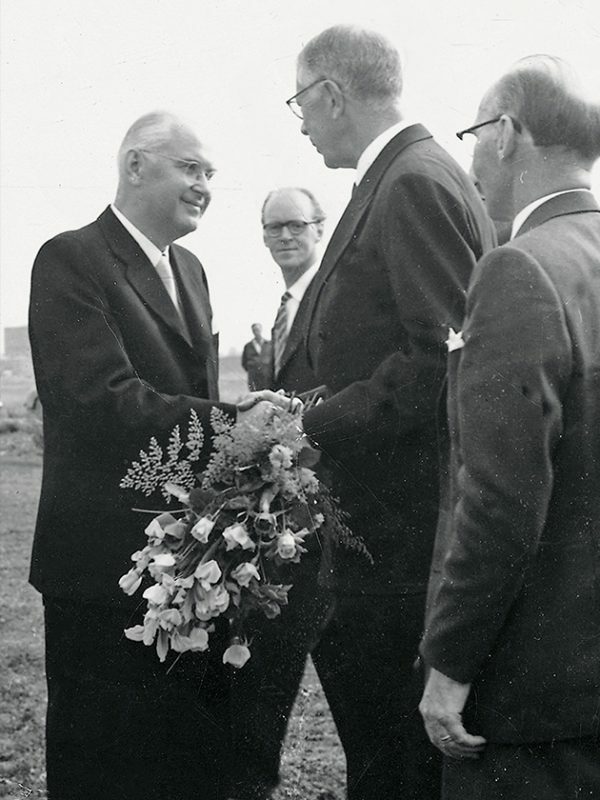 That was when master saddler Pehr Adolf Janson laid the foundation for the successful company, which is today represented in 40 countries and across four continents. Besides manufacturing saddles and leather goods, in the 19th century, making mattresses was part of the saddler trade. At the end of that century and with demand increasing, the family soon focused more and more on the manufacture of mattresses. 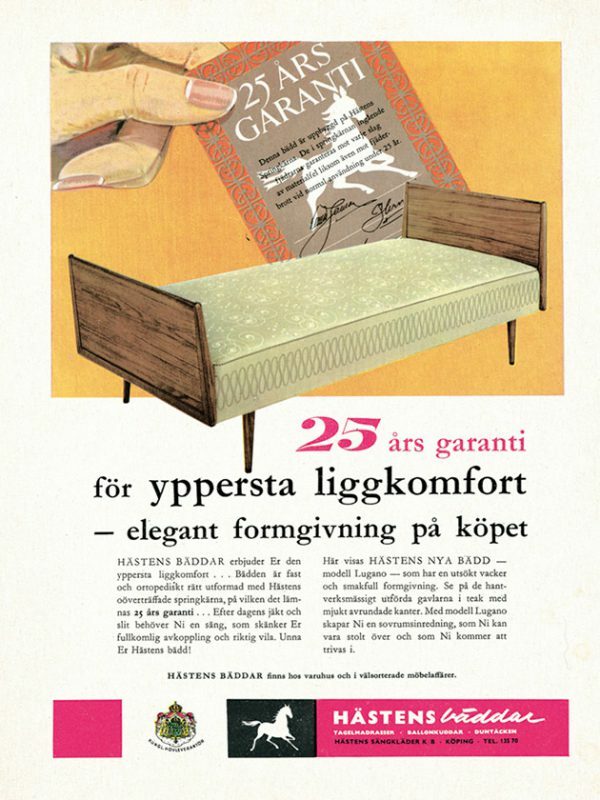 In 1917, David Stefanus Janson, the third-generation owner, decided to concentrate entirely on mattresses and beds. In the same year, the company added a spinning mill to process the horsehair. Even back then horsehair was already one of the most important elements of handmade mattresses. According to company records from 1920, 20 tons of the finest horsehair from around the world were processed that year alone. Apart from craftsmanship and expertise, the use of top quality materials is, to this day, an article of faith for Hästens. The significance of this becomes clear when you look at the production of box spring beds in detail. Only natural materials are used, no latex or foam, but instead cotton, linen, pure new wool and natural horsehair, sourced abroad in line with strict quality standards. “With horsehair, for example, we use only the middle part of the horse’s tail,” says production manager Tobias Stolpe, when explaining the demands on the raw materials. Each of the hairs acts like a miniature air-conditioning unit, he says. Hollow on the inside, its tiny capillary system ensures the removal of moisture to the outside, and the influx of fresh air. The client decides the quantities, and the combinations with other materials, in which the fine natural product is processed into the layers. Much depends on the customer’s individual needs. The dimensions of the bed and mattress are also made according to a client’s particular wishes. For the bed frames, only the wood of slow growing pine trees from Swedish forests is used. This approach, carefully thought-out and perfected over generations, wins over roughly 20,000 clients from around the world each year – among them sports stars, actors and captains of industry, as well as the Swedish royal family. Since 1952 Hästens has been able to proudly call itself purveyor to the royal court. 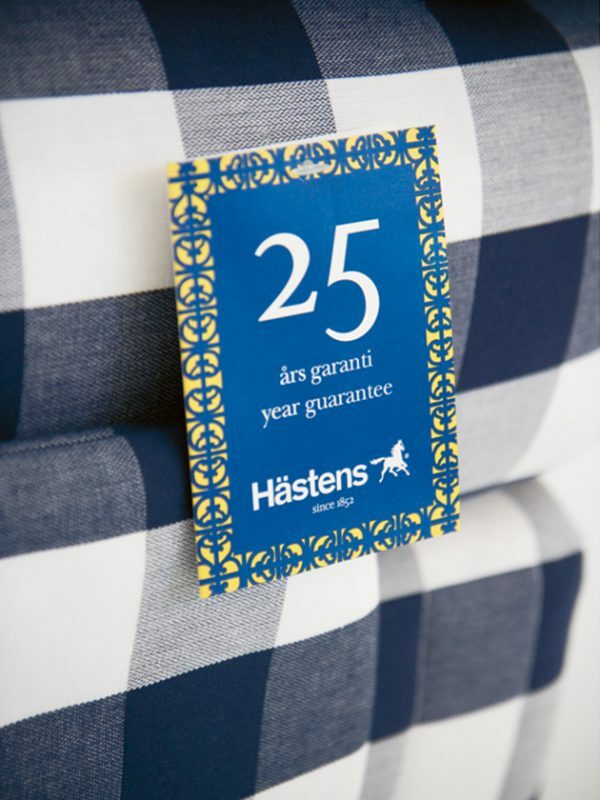 Two years prior to this, the then owner Janson had introduced the 25-year-warranty certificate for Hästens beds, and had so devised the company’s quality promise. It is a promise that is mainly founded on the skills of the 120 employees in the production hall. Step by step, they are responsible for processing the natural materials: for assembling the layers, sewing the fabric covers – which must be exact to within a millimeter; for accurately stitching on the overlays and meticulously trimming the seams. Perla Munhoz Bovin, Head of Research and Development, says, “Many steps in the process can only be done by hand and require exceptional manual dexterity, like evenly spreading out the horsehair. No machine can do this as uniformly.” This kind of craftsmanship requires time. A lot of time. It takes 320 man-hours to complete the high-end “Vividus” model. When working on the outer cover, just carrying out the quality control of the mechanical stitches and knots, applying the special precision stitching by hand, and tidying up the seams will take a specialist a whole day. The incredible price of this extraordinary bed is around €125,000. At that price “Vividus” seems sure to merit the title of most expensive bed in the world. For this princely sum, the Swedish manufacturer confidently promises to supply the “most perfect, most luxurious bed on earth.” You can only try out this lavish specimen as part of a VIP event in a few exclusive locations. Most Hästens customers, however, are more price conscious. They choose a standard size, 180×200 centimeter model in the lower five-figure-sum bracket. Hästens is constantly expanding, and today has more than 200 locations in Europe, the United States, Asia and South Africa. 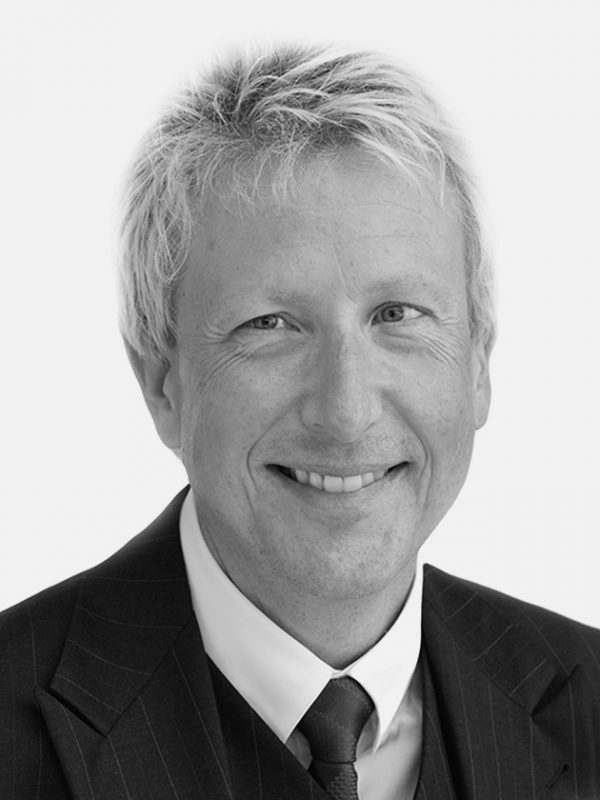 Executive chairman and owner Jan Ryde has been in charge of the company since the late 1980s. His approach is as relaxed as his results are impressive. Under his leadership, sales of Hästens beds grew by nearly 20 percent worldwide compared with the previous year, reaching 57.8 million euros in 2015. This increase forms part of a personal mission for Jan Ryde: “I would like to improve people’s lives and, with our beds, make the world a bit more livable.” This mission is also symbolized by the blue-and-white checked pattern, which is the company’s distinctive trademark and has been registered since 1978.